Berol China markers are paper-wrapped, wax-based pencils used for writing on hard surfaces such as glass, metal, ceramics and photographs without scratching or tearing the surface. 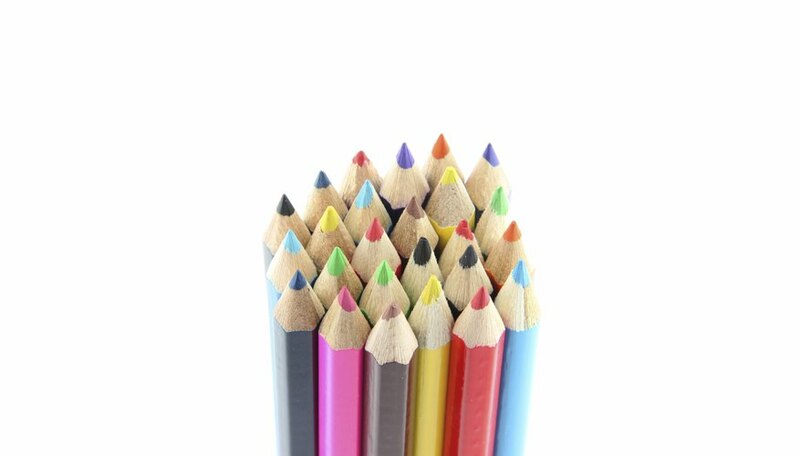 Also called grease pencils, wax pencils, or technical pencils, these types of pencils were commonly available by the end of the 18th century for industrial and business uses. China markers were not originally intended for artistic purposes, and although they may be used to draw, they come in a limited range of colors: white, yellow, orange, red, blue, green and black. Grasp the grease marker firmly in one hand. With the other hand, take hold of the short piece of string sticking out at the writing end of the pencil. Slowly pull the string down towards the blunt end of the grease pencil. Pull the string only a short distance. As you pull, the outer colored wrapper will split, revealing an inner paper core. Slowly unwind the paper core, which is perforated. Tear it off close to the body of the pencil so the paper does not get in the way when you use the pencil or get caught on anything. Cut the string with a pair of scissors or knife if it gets too long or gets in the way. Do not rip the string off of the pencil. Sharpen the point on the grease pencil using a pen knife, if a thinner point is desired. Alternatively, a crayon sharpener may be used. If you don't have a pen knife, a small Swiss Army knife, paring knife or scalpel will also work. When sharpening with a knife, always make sure the blade is facing away from you. Don’t try to sharpen a grease pencil in a pencil sharpener.